The White House declined to deny the remarks made by communications aide Kelly Sadler. 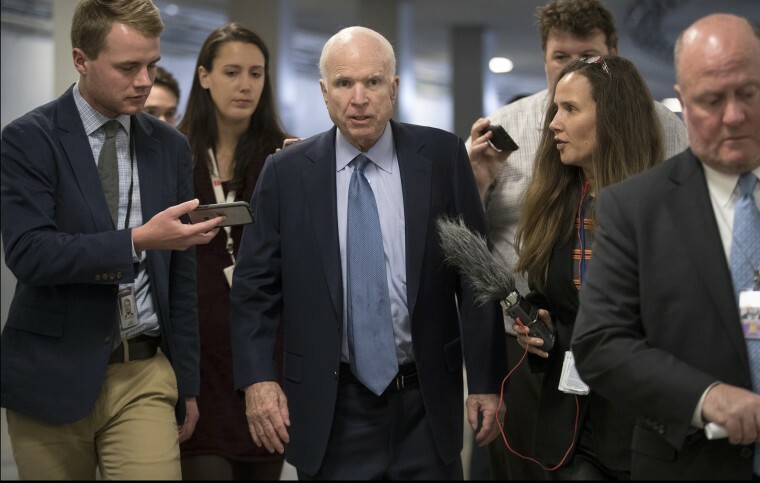 A top White House communications aide made fun of Sen. John McCain's brain cancer diagnosis on Thursday, sources with direct knowledge said — comments that enraged the senator's wife. The comments, which were first reported by The Hill, a Washington political newspaper, came during a meeting a day after McCain, R-Ariz., announced that he was opposing the nomination of Gina Haspel to be permanent director of the CIA. "He's dying anyway," said Kelly Sadler the White House's director of surrogate and coalitions outreach, according to three sources with direct knowledge of the meeting. The White House didn't deny that Sadler made the remarks. Asked for comment, it said in a statement only: "We respect Senator McCain's service to our nation and he and his family are in our prayers during this difficult time." The comments dismayed many Republicans on Capitol Hill, where McCain, who was first elected to the Senate in 1986, is a widely admired figure. Multiple Republican sources and aides told NBC News on Thursday night that they had been on the phone with colleagues expressing disbelief about what was said. Multiple White House spokesmen didn't respond when asked about Sadler's future in the Trump administration. McCain, 81, who was tortured by his North Vietnamese captors during the Vietnam War, said Wednesday that he opposed Haspel's nomination because of her role in the CIA's use of brutal "enhanced" interrogation techniques after the terrorist attacks of Sept. 11, 2001. "Ms. Haspel's role in overseeing the use of torture by Americans is disturbing," McCain said. "Her refusal to acknowledge torture's immorality is disqualifying." Haspel said in a statement Thursday: "I have the utmost respect for Senator McCain and I appreciate the thoughtfulness with which he has approached this nomination process." McCain's office had no comment. But his wife, Cindy McCain, responded sharply on Twitter in a post addressed to Sadler on Thursday, writing, "May I remind you my husband has a family, 7 children and 5 grandchildren." His daughter, Meghan McCain, who is a co-host on ABC's "The View," also responded to the remark on the show Friday with a biting comment of her own directed at Sadler: "Kelly, here’s a little news flash...we’re all dying." She went on to thank those who shared well wishes for her father and how her father's career and character have made her proud. "Don’t feel bad for me and my family, we're really strong. There is so much more love and prayer being generated for us than anything negative at all," she said. She added, "The thing that surprises me most is I don’t understand what kind of environment you're working in when that would be acceptable and you can come to work the next day and still have a job. And that’s all I have to say about that." McCain has remained at home in Arizona with glioblastoma, a form of brain cancer. He was also mocked Thursday on the Fox Business Network by retired Air Force Lt. Gen. Thomas McInerney in a defense of harsh interrogation tactics. "The fact is, is John McCain — it worked on John," McInerney said. "That's why they call him 'Songbird John.' "
No evidence has ever emerged that McCain revealed accurate information to the North Vietnamese. He wrote in his autobiography that he gave made-up information to mislead his captors. In response to strong criticism, Charles Payne, a host of the program on which McInerney was a guest, acknowledged on air that "a guest made a very false and derogatory remark about Senator John McCain." "As a proud military veteran and son of a Vietnam vet these words neither reflect my or the network's feelings about Senator McCain, or his remarkable service and sacrifice to this country," Payne said. Kasie Hunt and Dartunorro Clark contributed.